The extreme northwest corner of Montana is influenced by the modified Pacific Maritime Climate, which basically means we are in a rain shadow belt of the coast and receive a good deal of moisture. This increased moisture has effects that benefit our area. Our plant diversity for instance, is greater than many other areas of the state. This factor helps create lush forests and high tree growth rates, as well as thick undergrowth and many species of shrubs, grasses, and sedges. In turn, the vegetative component diversity helps create varied habitats that support a unique array of wildlife. Just think about how lucky we are. We have Rocky Mountain Goats, Bighorn Sheep, Black and Grizzly Bears, Woodland Caribou, Rocky Mountain Elk, Moose, Mule and White-Tailed Deer. In the Felid, or cat family we have Mountain Lions, Canadian Lynx, and Bobcats. The Canids, or dog family members that inhabit our area include Wolves, Coyotes, and Red Fox. Multiple weasel family members present include Wolverine, Fisher, Pine Marten, North American River Otter, Mink, Striped Skunk, Long-Tail and Short-Tail weasels. That’s just to mention a few, and doesn’t even include the plethora of birds of prey, game birds, waterfowl, woodpeckers, and songbirds. Nor the myriad of fish species we enjoy in our beautiful area. Taxidermy is generally defined as the preserving of an animal’s body by mounting over a framework or stuffing, for the purpose of display or study. The word taxidermy describes the process of preserving the animal, bird, or fish and the finished product is called a taxidermy mount. The word taxidermy comes from the Greek words taxis and derma. Taxis means to make, and derma means the skin. Taxidermy takes on a number of forms and purposes including hunting and fishing trophies, natural history museum displays, and large diorama scenes for sporting goods manufacturers. Preserving animal skins is an age old practice. Embalmed animals have been found with Egyptian mummies. In the middle ages, unrefined examples of taxidermy were displayed by astrologers and those who practiced primitive medicine. Early methods of the preservation of birds for natural history museums were published in 1748 by Reamur in France. Around the 19th century, many towns had a tannery business. Hunters began bringing trophies to upholstery shops, and upholsterers would sew up an animal skin and stuff them with cotton and rags. Notable taxidermists include Carl Akeley, American biologist who contributed to the American Museum of Natural History. Also Martha Ann Maxwell, who is considered the first woman naturalist to obtain and mount her own specimens. And last but not least, John Hancock, who was a famous British naturalist and ornithologist who is considered the father of modern taxidermy. Hancock was an avid collector of birds which he would shoot himself, and then make his own mounts. And that’s exactly the way Gerry Mercer got started. Gerry comes from a family that enjoyed hunting and fishing, as well as having a great love for the outdoors and animals. While reading outdoor magazines, young Gerry saw ads for taxidermy books and manuals. With his parents encouragement, he bought a home taxidermy kit and started by mounting a Rock Pigeon he had shot. This evolved into skinning his own kills, and being into it, he figured he would try taxidermy school. Mercer attended the school in Bonner, Mont., and learned enough to give the taxidermy business a try. 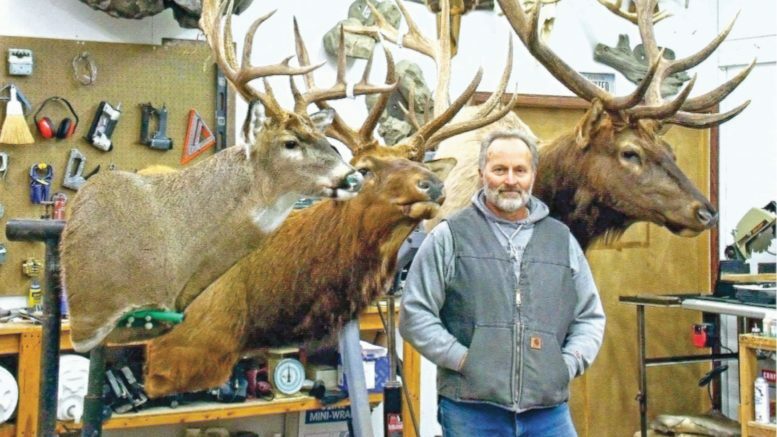 While working in Libby, Gerry saw a taxidermy shop for sale, and after meeting the owner Scott Leonard, worked out a deal to rent the building, and buy the business. That was almost thirty years ago, as Gerry’s shop opened in 1990 here in Libby. Since then, he has traveled to numerous taxidermy shows, entered competitions, and won many awards and blue ribbons. But Mr. Mercer doesn’t brag on it too much. He’s a humble guy and realizes that numerous awards are not that important to his customers. What he knows is important to his clientele is their trophy coming out beautiful and lifelike. And this I can personally attest to. In the early 1990’s, I was working for good friend Jeb Butler’s company Lincoln Forestry. While working in the Yaak doing timber cruising and regeneration plots I would see numerous bucks in the area. Gerry personally likes doing big Mule deer bucks and Bighorn sheep as he has an affinity for those animals. Mercer also enjoys taxidermy as it keeps him in touch with like minded people like a dad and his son who are both so proud of the kill and the mount. When asked what inspires him, Gerry said, “I love it. I see the total picture. Most folks focus on antlers, and the bottom line is I can’t mess up antlers, God made them, they’re already done. I must put the rest together to look like a live animal. I need to make it anatomically correct, fix bullet holes, and make it look alive.” And that he does. Mercer Custom Taxidermy is located at 90 Reedway Drive in Libby. The outfit is a full service taxidermy shop, and a big game and fish specialist. They are Libby’s oldest licensed taxidermist. The phone number is 293-6041, and you can visit the website at: https://www.facebook.com/mercercustomtaxidermy/.